Ten weeks. Ten weeks I've had the honor of welcoming talented bloggers to share my space here at girlichef! And each and every week I want to reach into my screen and grasp a couple of popsicle sticks to bring back out. There has not been a single one that I did not want to try! Who's Holding the Stick: This week, please help me welcome another of my favorite blogging friends, Faith of the blog An Edible Mosaic. Now, I'm sure exactly how long I've known Faith...a couple of years maybe? But even before I knew her, I knew of her. Aside from gorgeous photography and recipes that set my tummy a growling on her blog, she has an amazing cookbook with a prominent space on my bookshelf (and in my kitchen - every recipe I've tried has been delicious). Plus a couple of fantastic smoothie e-books (along with Alyssa of Everyday Maven). I could go on and on, but I want to let her speak...please help me welcome Faith! First I have to give a huge, heartfelt thank-you to Heather for inviting me to participate in her Summer of the Popsicle event. She is one of the sweetest bloggers I have had the pleasure of getting to know, and on top of that she’s a complete inspiration and incredibly talented. Thank you so much for inviting me, Heather! Growing up, I was all about the frozen treats when summer vacation hit. I’d be out riding my bike all day long – with or without one of my friends in tow, it made no difference to me – only returning home briefly to simultaneously re-fuel and cool down with a deliciously frozen goodie. Which, I have to say, was usually a freeze-pop, because they were the most portable frozen treat…and when you’re a kid and riding your bike is your number one priority, portability is high on your list of demands. Rainbow-colored, “fruit” flavored (haha, who knows how they get the fruit flavor, lol!) twin pops were also a favorite. And push-pops. Oh, and fudgsicles. 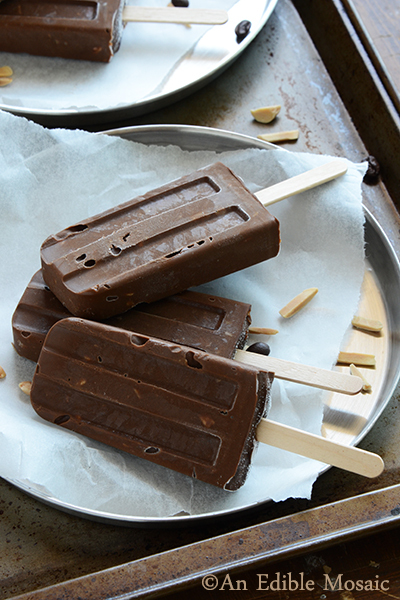 Mmm, fudgsicles. And if a real treat was in order, I used to love going to a local ice cream stand and ordering a soft serve cone of what they called “Swiss Mocha” flavor, which was basically chocolate with a hint of coffee and toasted almond. 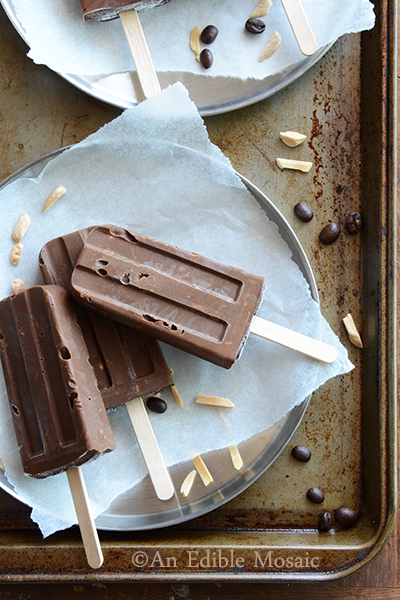 Although it’s still a favorite of mine, Swiss Mocha seems to be an elusive ice cream flavor these days, which is why I decided to re-make my own version of it into healthy fudgsicles. 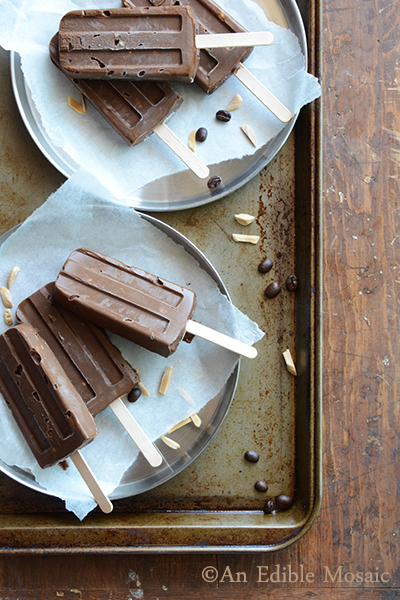 Because when warm weather hits, I’m still all about the frozen treats. These healthy beauties are everything I remember about Swiss Mocha: predominantly chocolate, with a hint of coffee and a touch of toasted almond. And the avocado? 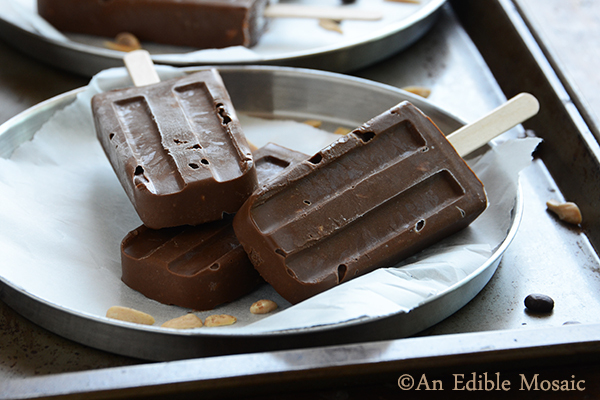 Other than the super velvety consistency of these fudgsicles you won’t even know it’s there. Puree all ingredients except the almonds in a food processor until smooth, scraping down the sides of the bowl as necessary (the mixture will be about the consistency of pudding). Add the almonds and pulse a couple times to coarsely chop and incorporate them. Spoon the mixture into popsicle molds, making sure not to fill the molds over the “fill” line, since liquid expands as it freezes. (My molds are 2 1/2 oz/75 ml and I got exactly 6 popsicles.) Gently tap the mold a couple times on a hard surface to help any air bubbles escape. Freeze for 30 minutes, then insert the sticks (waiting 30 minutes ensures that the sticks won’t sink all the way down). Return to the freezer and freeze completely, about 2 to 3 hours more, depending on the size of your popsicles and how cold your freezer is. To easily unmold the popsicles, dip the plastic bottoms in warm water and they should slide right out. Once completely frozen and unmolded, I like to wrap each popsicle individually in plastic wrap so it’s easy to grab one whenever a craving hits! These look so creamy and rich and like-they-belong-in-my-belly, Faith. 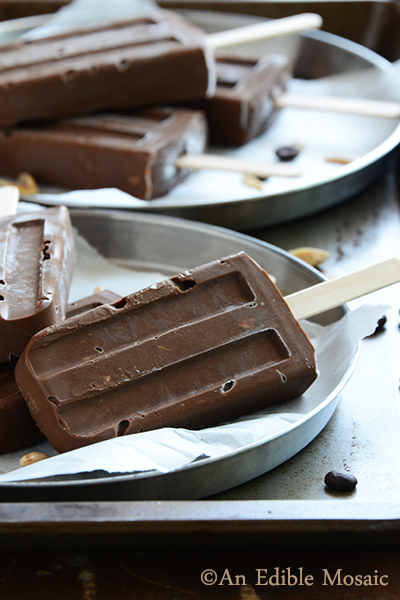 Thank you so much for taking over for me today and sharing these amazing fudgsicles with us! So, once you're finished contemplating on how many times to multiply this recipe so that you can stock your freezer for the rest of the summer, be sure to drop by and visit Faith at her blog, An Edible Mosaic...or find her on Facebook, Twitter, Instagram, or Pinterest.